More and more, not only Canon 5D photographers and filmers are curious about the possibilities manual lenses offer. The experiment, if they are your karma and your thing, is mostly not that expensive than the acquisition of a new lens with AF, you sell six months later lossy because you realized, it has been used too infrequently to legitimate it's price. Ergo - if you have a good eye sight, hundreds of interesting bargain-lenses are waiting to be discovered, but some of them may cause problems with the mirror of your Canon 5D, whose mirror is known to foul lenses with a bigger extend than the Canon ones. This list tries to give you a rough overview of the lenses, which are not/clearing the mirror of the 5D "family" (MK I, II, III, 6D) when they are focussed to infinity. For any detail information, workarounds, bargain acquisitions and exchange with other Manual-Focus-Mates you might join the forums in English, French and German language meant in the footer. Photography is like Esperanto, don't hesitate to meet like-minded people worldwide! The focal range from 100 mm upwards is generally less affected, so it does not appears here - except five exotics causing mirror problems - the ISCO Göttingen Tele-Westanar 3.5 / 135 mm, an old Vivitar 2.8 / 135 as well as the Steinheil München Auto D Tele Quinar 3.5 / 135, the Schneider Kreuznach 3.5 / 135 Tele Xenar, and a Prakticar 4.5 / 70-210 mm, the only known lenses as far above 100 mm, which are fouling the mirror of the 5Ds. Any further additions are very welcome. Be prepared and please use the results here at your own risk. Have fun! AGFA Color 1.4 / 50 mm * Canon 6D n User reported success with an adapter where the focus mark points to 2 O'Clock, and you will have to remove the plastic "nose" at the aperture lever. Zeiss Ultron 1.8 / 50* hits at 6 m y ? Just clips mirror at infinity on a 5D Mk.II and a 6D, a slight adjustment clears the mirror y ? seems to work scarcely, be careful (with this axe, Eugene) Canon 6D n ? 3.5 / 20 mm * y y Unmodified it will not even mount on the camera, due a protruding lip that protects the rear element. One needs to cut or file down this lip. Nikon Nikkor (non-AI) 4 / 20 mm * y This lens has a metal piece that extends back. It is not a question of clearing the mirror, but simply not going on at all. It will work on an APS-C cameras. Filing may work. @ Fotodiox M42-EOS adapter y User reported success using 3 shims à 0,2mm. Estimated optimum 0,7mm. Porst M42 (Porst was a German photo vendor with chain-stores across the board in the Pre-Amazon-Era. Cameras and lenses from Russian, German and Asian makers. Leaded by an excentric CEO which finally gave away his corporation to his employees. Sic! Dig the extraordinary PORST history @ kamera-geschichte.de translated by Google. 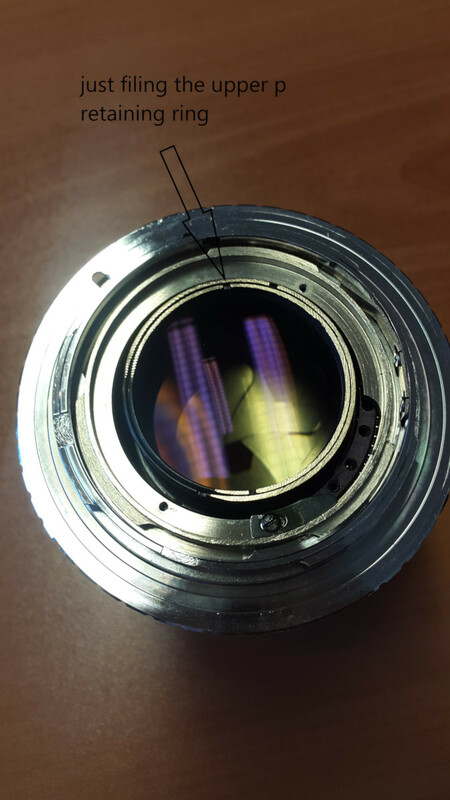 Can be mounted on a Canon body by carrying over the same procedure as with Pentax K lenses (removing protective ring and, sometimes, filing the aperture activation lever). Infinity adjustment is required (the adapters are too thick due to the register distance being too close to Canon). hits the mirror mid-way to infinity y Can be modified by filing the rear lens heavily. New design. First version. Made by CZJ. Two versions exist. Mirror meets the rear lens at about 5m. Schacht Ulm S-Travelon-A 1.8 / 50 mm M42 * y filing may work ? MIR 10A (KMZ) 3.5 / 28 mm * That MIR 10A built in 1987 blocks the mirror of both Canon 5D & 5D Mark II when focused to infinity, so be careful y ? According to a user report at Canon 6D the range between 0.7m until 15m seems to be OK. y Trim 2 mm of the rear end. preset zebra (MMZ, Zenit 3M kitlens) y Trim 3mm of the rear end. * = I don't own the lens. The report is a contribution. Outstanding Japanese third party lens site, please use the link at the right top edge to translate it by Google in your language. 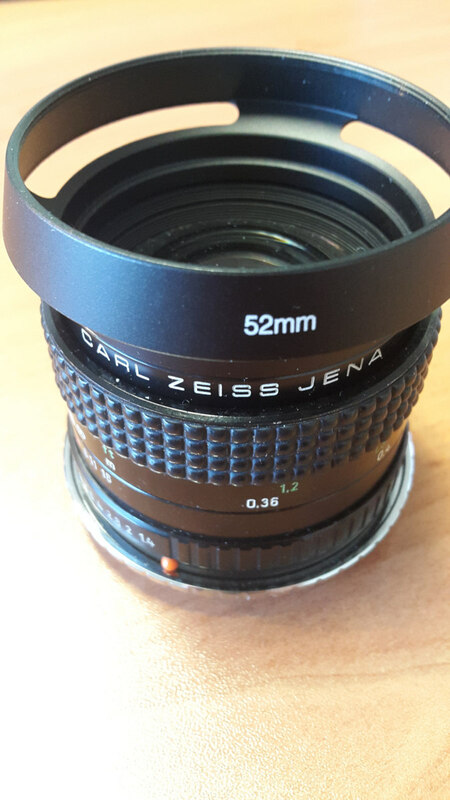 A multilingual forum for manual lens users: forum.mflenses (mainly in English/German). 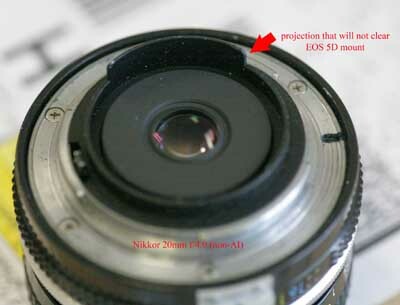 Provides a 5D Mark II lens compatibility chart. Latest discovery: Vintage Camera Lenses - Vintage Photography from Analog to Zeiss (english language) Provides an adapter guide. Last but not least - another lens compatibility list for Contax, Leica and Olympus lenses at 16:9.net and instructions how to shave the 5D mirror.